Malcolm Gladwell wrote a wonderful review of our analysis of the NBA in this week’s New Yorker. Given Gladwell’s prodigious talent as a writer, it is not surprising that he could tell our story so well. Having reviewed some of the reaction to his story, though, I thought it would be useful to summarize what our research indicates about decision-making in the NBA. Here is a point-by-point summary of the story we are telling about the NBA. 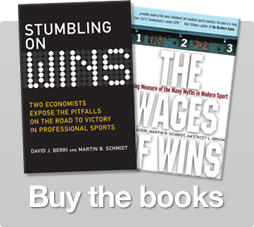 Payroll does not explain much of wins in the NBA, MLB, or NFL. Specifically, payroll only explains 12% of the variation in wins in the NBA. In baseball explanatory power is 18% while in the NFL it is below 5%. We think the low explanatory power of payroll in baseball and football can at least partially be explained by the relative inconsistency of performance in these sports. As we note in our book, across time in baseball and football we see fairly wide variations in player productivity. After all, who expected the Detroit Tigers to be so good this year? Relative to these sports, though, performance in the NBA is more consistent. So why is payroll still unable to explain much of wins? We think the answer lies in how players are evaluated in the NBA. For more than two decades economists have looked at the link between player salary and various performance statistics. Scoring totals are the only player statistic that consistently explains player pay. Shooting efficiency, rebounds, steals, and turnovers do not consistently offer much explanatory power. We updated these studies in our book. Our story, though, was essentially the same. Scoring totals are the one statistic that matters most in determining player pay. How much players are paid is not the only decision economists have examined. Ha Hoang and Dan Rascher published a study in Industrial Relations in 1999. The Hoang and Rascher study looked at the factors that caused a player to be cut from an NBA roster. The only player statistic these researchers found to matter was scoring. All other player statistics did not matter. We have looked at the coaches voting for the All-Rookie team and the factors that impact where a college player is drafted. What matters most? Again, scoring matters more than factors associated with getting possession of the ball (i.e. rebounds, turnovers, and steals). Wins in the NBA, though, are not just about scoring. Possession factors have a large impact on the outcomes we observe in the NBA. When you look at all the statistics the NBA tracks you find that with these you can explain 95% of the variation in wins. And when you look at all these statistics you find that you can create a very accurate estimate of the wins each player produces. From all this what do we conclude? Conventional wisdom in basketball is incorrect. Players who only score are not as valuable as people think. Players who do not score much — like Ben Wallace and Dennis Rodman – have a bigger impact on team wins than people seem to think. Does this fit what many people believe about the NBA? No, but as academic research often indicates, what people believe does not always match what the data says. 253 Responses to "Summarizing Our Thoughts on the NBA"
I haven’t read the book, but I’ll definitely pick it up soon. I don’t doubt that a player’s win coefficient should be the single most important value determining factor. But there is value in other dimensions. Ticket sales for example. Pundits are pushing Portland to select Adam Morrison in the draft not because they think he’ll turn the franchise around, but that he’s a local boy and will bring some respect to a floundering franchise. I’m curious if there’s been any empirical work on this. I assume it would be pretty easy to measure, and there’s probably a strong correlation between perceived win coefficient (who pundits and coaches think matters) and increased ticket sales. So Allen Iverson would be a more profitable investment in terms of revenue than Ben Wallace. Guys, while I applaud your attempt to assign numerical descriptions to a player’s worth, I must disagree with your methods and conclusions. Quite simply, you guys are the equivalent of Gladwell, Dubner et al…’popular’ statisticians looking to create names for yourselves by presenting ‘counterintuitive’ theories. An example of your stupidity: your ‘debunking’ of the Alan Iverson ‘myth’. As any rational viewer of the NBA can tell you, Iverson’s value transcends simple analysis of field goal percentage and turnover count. For example, in the Sixers championshipo run year, Iverson was the Number 1 option in the offense, more so than any other player in the league. His role was not just to put the ball in the bucket, but, in the alternative, to get the shot off so players could crash the glass and grab offensive rebounds. The strategy worked beautifully. Even when Iverson would register 40% shooting nights, the tema would win due to the offensive putbacks. When a player can draw 2 or 3 or 4 players and still get his shot off, the offensive rebounders will have a field day. The fault for your irrational analysis may lie with the NBA stats. Unlike in hockey, a player doesn’t register an assist when his shot doesn’t result in a goal, but rather is rebounded and then put in by another player. As well, there is little understanding of the difference in 3 point field goal percentage and two point fg percentage. as well, drawing fouls is not properly accounted for. A more correct approach (though not perfect) would be to account for each offensive trip down the floor and assign a numerical value to the trip…i.e. if iverson draws a foul and hits both free throws, he would receive a 200% score. if he hits a three, he would receive a 300% score. if he misses on a drive, that results in a 2 point offensive putback, he would also recieve something like a 200% score. how many championships to sixers have won? For that matter, how often have they reached the conference finals since Iverson joined the team? compare that with the nets since Kidd’s arrival or the Pistons since they acquired Ben Wallace. I agree there is value added beyond wins, but I don’t see what wrong with trying to use statistics to generate a less noisy measure of value added. IVERSON has been surrounded by crap for the most part of his career. Not very often being surounded by someone who could help him and team see Chris Webber. If you want to note how many championships the nets or the pistons have won. You will note the nets have won O. And the pistons only because the TRADE for a player who put the BALL in the basket(Rasheed Wallace) did the Pistons win a championship. You can say they were a great defensive team before hand and I wont disagree losing so badly the season before hand to pick 2nd in the draft process says a lot. Chancey billups improved game along with the aquisition of R. Wallace helped the team over come the hump. Although when your player known as Big Ben came into the picture in the last eastern finals I believe someone called Dwayne Wade(Scoring) put your defensive players behind to the point that they didnt play Big Ben because they needed offense to win the game. You can argue many factors helped cause this in the game but at the end of the day the team that puts the ball in the basket the most times by the end wins. Defense does win championships but without some offense it is useless..